You can also read this article on The Examiner Website. NETWORKING group based in Huddersfield is combining new technology and tradition to bring businesses together across West Yorkshire. The Mid Yorkshire Network – which makes use of online communications and old-fashioned face-to-face meetings – began life three years ago under its original name of the Kirklees and Calderdale Business Group. Following a rebrand last August, the newly-named MYNetwork now has more than 900 members – and continues to grow in numbers. 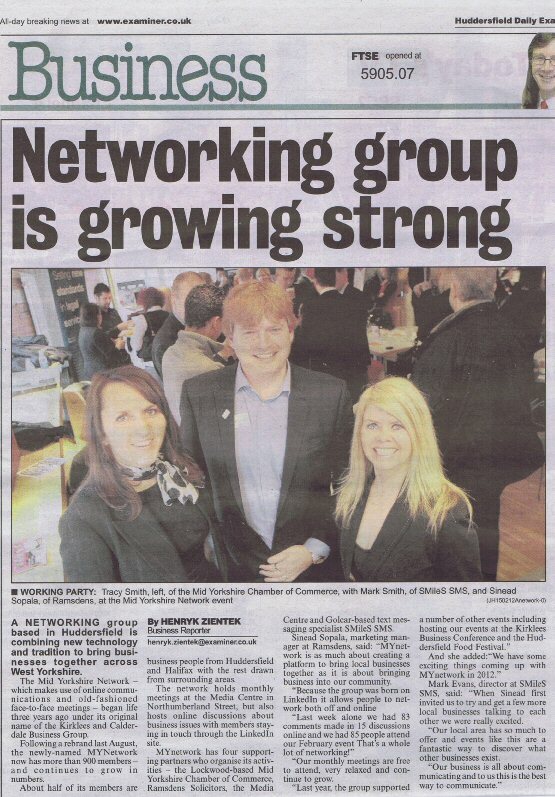 About half of its members are business people from Huddersfield and Halifax with the rest drawn from surrounding areas. The network holds monthly meetings at the Media Centre in Northumberland Street, but also hosts online discussions about business issues with members staying in touch through the LinkedIn site.